Today i will tell you “How To Create Your Own Google Chrome Theme Easily” , yes it is possible to create your own google theme for your chrome browser. To know the trick, read the full article thoroughly. Google chrome is the most using browser in the world, it’s fast surfing and light weight makes it the most popular browser among internet surfers. In today’s time millions of peoples are using google chrome for surfing the web, and they loves it’s speed even in low speed connections. But do you know? you can make your own theme for your favourite internet browser google chrome. Yes it is possible to customize your google chrome screen easily without any coding skills. 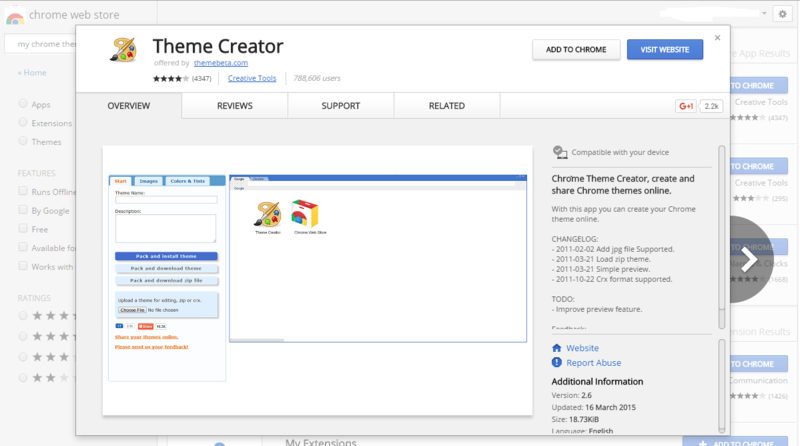 So follow the guide given below to know how to make your own google chrome theme easily. In this trick we will use a google chrome extension, which will allows you to make your own google chrome theme easily in just simple steps. So just follow the steps given below to create your own google chrome theme with this awesome extension. 1. First of all you will need to download “My chrome theme extension” in google chrome. 2. When the app is successfully installed into google chrome, it will reach in this path. Open the application by going to application path. 3. Now first of all upload an image, which will be used as a background for your theme. 4. After uploading a picture now click on generate colours tab, here you can customize its colours, frames and many more options will be there to customize your image. 5. After customizing your picture and enhancing it in a beautiful look, now click on pack and install tab given below. 6. Now it will ask your permission to install your customized theme into google chrome. 7. Allow the theme to install in google chrome, and save it online if you want. 8. That’s it, now you have successfully create your own google chrome theme in very simple steps. So that is how you can easily make your google chrome theme without any coding skills, and in few minutes. If you like this post then don’t forget to share it with others and tell them about this cool google chrome extension, for making customized theme for your google chrome browser. Stay connected with us for more interesting and innovative tips&tricks of Pc, android,softwares, iPhone etc. Don’t forget to follow us on social media for better notifications of our new articles in your news feeds.